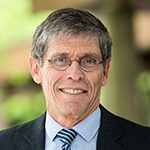 As Vice-Dean, Health Engagement, Dr. Michael Allard is responsible for working with the provincial health authorities, relevant health and academic organizations, and government to facilitate, coordinate and optimize academic activities and foster their integration to support the health system in B.C. Dr. Allard completed both his undergraduate and medical degrees at UBC. Following a rotating internship at St. Michael’s Hospital in Toronto, he returned to UBC for a residency in anatomic pathology that included a research fellowship in the UBC Pulmonary Research Laboratory. He then undertook a cardiovascular research fellowship at the University of Alabama at Birmingham, returning to Vancouver in 1990. His research has focused primarily on mechanisms responsible for adaptation of the heart to exercise and hypertension. More recently, Dr. Allard has turned his attention to developing approaches to assess academic workload and to enable better integration of clinical and academic activities in pathology practice settings. Dr. Allard is a Principal Investigator in the James Hogg Research Centre and a Cardiovascular Pathologist at St. Paul’s Hospital, and he remains actively involved in educational programs at UBC. Dr. Allard previously served as Head of the UBC Department of Pathology and Laboratory Medicine from 2009 to 2018. He is currently President of the UBC Medical Alumni Association.